Retail Price: $24.99 Log in for LOWEST PRICE! 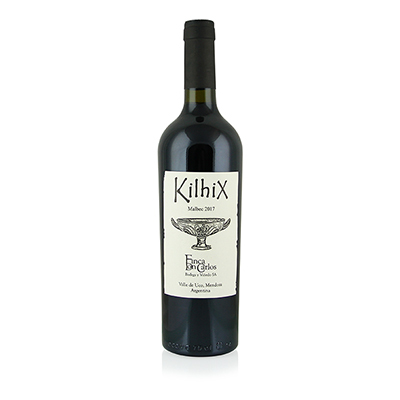 Finca Don Carlos, crafters of our Kilhix Malbec, has been creating wines of distinction in the Tupungato region of Argentina's Mendoza district since 2003. Tupungato is one of the fastest growing wine areas in Argentina because of its spectacular soil and climate. It has drawn the likes of many of the finest international wine operations to its boundaries to craft amazing wines. Winemaker Gustavo Silvestri and vineyard manager Patricia Conte work in concert with each other to produce the finest wines possible from their 123-acre estate here. The name "Kilhix" is the Latin word for a wine cup that was used in ancient Rome, where wine was a delicacy for the rulers. Our selection is wine fit for royalty. Malbec is the supreme ruler of Argentina's wine industry. It is the grape that put Argentina on the wine map and for good reason. From top to bottom in price, it's almost impossible to get one that isn't impressive. When you put together the operation of Don Carlos, you get to the top of the heap. The grapes are grown at over 3,000 feet of elevation, assuring perfect sunlight in cooler temperatures. The yields are kept very low to maximize intensity, and then aged eight months in French and American oak barrels. What evolves is a rich and imposing rendition of Malbec, offering aromas of black currants and spice along with incredible flavors of plum, anise and cassis.